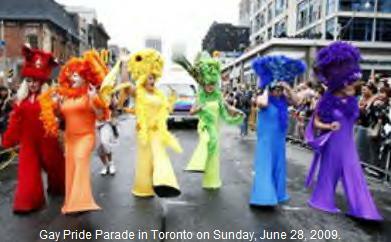 Stonewall Gazette: Has Toronto's Gay Pride Parade Become More About The Party Than Politics? Has Toronto's Gay Pride Parade Become More About The Party Than Politics? "Toronto's Gay Pride Parade might be the city's biggest bash of the year, attracting millions of spectators who proudly come to wave rainbow flags and cheer. But as the event gets set to celebrate a landmark 30 years, some activists say the politics have become lost in the partying." "An elite developed within the pride community, a wealthy elite that started to feel more of a benefit of this branding and this flowing of money from corporations,'' said Marusya Bociurkiw, an activist and professor at Ryerson University. Bociurkiw, 52, has traded in the traditional march for barbecues in her backyard and discussions with friends, although this year she will join the march to protest the banning of Queers Against Israeli Apartheid. But David Rayside, a professor of politics and sexual diversity studies at the University of Toronto, doesn't agree that the parade has lost its power. "For many people, it's just a party, for some it's an opportunity to be _ more than ever _ visible,'' said Rayside, as he argued the essence of the parade hasn't changed in 30 years.